Nisha, also known as Nisha HennaArts is providing henna tattoo services in Austin and Central Texas for more than 10 years. Nisha is artist and manages Henna Arts, LLC. The company was established in 2007 at Los Angeles and incorporated in 2010 at Austin, TX. 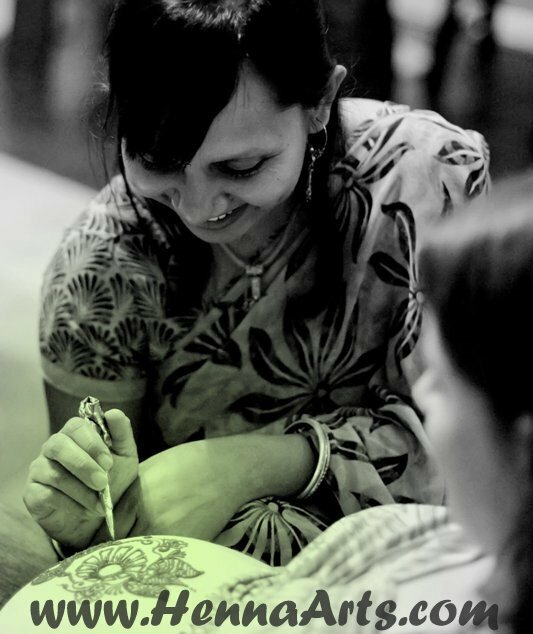 Nisha is a leading Henna artist with unique creativity, years of experience and skills developed in India. She is specialized in intricate ethnic, bridal, contemporary, Arabic henna design and exotic patterns. We provide Henna Services for all special occasions like Wedding, Birthday Parties, Baby Shower, Bridal Shower, Social gatherings, Bar mitzvah, Bat mitzvah, Graduation party, Sweet sixteen, Corporate events, Ceremonies or any special celebration to make the moment different and memorable. Nisha also takes classes to spread this art to interested kids and adults. She can visit your place for your convenience. We provide henna services for corporate events (like annual party) as well as for promotional events like trade show or product launch. We boast of being most successful entertainer in each event we have participated from SxSW interactive, Tuaca Body Art Ball to corporate annual gatherings. Here are glimpse of some of the events. We can also provide props and decorations on special Indian- Bollywood and Arabic themes. We bring Belly dancers, fortune tellers, balloon artists, caricature artists, hookah supplies with attendant and cater delicious Indian food. We can also help with mandap for Indian style wedding and take care of decoration for you. We have selected and latest gold plated fashion jewelry collection for wedding and parties. We always have latest range of Sari (Saree), Lehenga and party wear for ladies and also hand picked collection of kurta and latest dress styles for man. You can rent these fashion accessories from us if don't intend to keep them forever. Unique craft items handmade by tribal community in India. They are available online or in our studio for purchase. Visit the crafts section in the website. For bulk and wholesale purchase contact us. We carry range of Henna supplies, henna powder, paste and other body adornments like bindi, mang-tikka, nose-pins, payal (ankle bracelts) etc. We do have colorful jingling belly dancing scarves which you can just wrap around any dress or jeans and you are ready for the party. Check out Henna Supplies section. We do custom henna designs on picture frame or in wood plaque, mirrors, wooden instruments or any other item in which henna paste can be applied. If you are planning to decorate walls of your home with traditional Indian designs, we can do designs with wall paint. If you are looking for specific designs on cake, we can help there too. Checkout some amazing art work in the gifts section.